UPDATE 5/2/19: MIY Workshop is on the move! Find out more here. Whether you’re a complete sewing novice; have got as far as buying a sewing machine that’s now gathering dust in a cupboard; or are a more experienced sewer in need of a bit of help with a new project, a few classes can help set you off in the right direction and boost your confidence. Come along and make clothes, accessories, do your own alterations, or whatever takes your fancy! All MIY Collection sewing patterns and all patterns from all of my books “The Beginner’s Guide to Dressmaking” “A Beginner’s Guide to Making Skirts” and “A Beginner’s Guide to Sewing With Knitted Fabrics” are available for students to use in classes at no extra cost. All classes are open to everyone regardless of previous experience. learning how to adapt and fit patterns. You don’t have to stick to the same class each week, you can swap and change times and days (subject to availability). 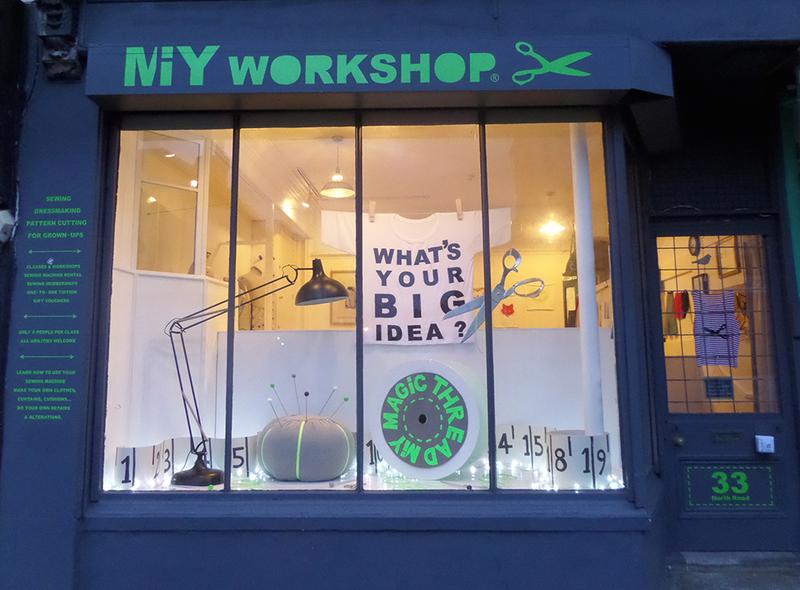 Held at MIY Workshop (33 North Rd, Brighton, in the North Laine). £50 for 2 classes payable before you attend your first class. Your 2 sessions must be used within 2 weeks of your first class. Find out more about your teacher here. Read what other students have thought of classes here. If you are thinking of booking a class please make sure you read the Classes – important info section of my website which contains important information about cancellations. Thanks! Hi Jo, how fantastic – lucky you! Right, you need to get it working asap……you can bring it along to weekly classes and I can get you up and running on it. Or, if it’s a pain to lug it along to classes I have plenty to use in the workshop – they’re Janome Sewist machines so nice and easy to use. If you’d like to book something, send me an email to post[at]wendyward.co.uk or give me a ring on 01273 775951 and we can sort out dates, etc. Do you ( or do you know of anyone) who runs classes in pattern cutting? Hopefully we’ll see you at a class soon!